By Daniel Horowitz--Myelodysplastic syndromes (MDS) are a group of diseases that affect the bone marrow and blood. Some types of MDS are mild and easily managed, while other types are severe and life-threatening. Mild MDS can grow more severe over time. It can also develop into a fast-growing, severe leukemia called acute myelogenous leukemia. On February 11th, a Montreal couple’s worst nightmare was realized when their beautiful four-year-old daughter, Jayden Roll, was diagnosed with MDS. Now, with time as the enemy, and with little Jayden’s bone marrow failing, desperately in need of a transplant, her parents Warren Roll and Kelly Goodman-Roll are doing everything in their power to save their little girl by trying to locate a stem cell donor for a life-saving transplant that must occur in the coming weeks. No one in Jayden’s own family – neither her parents nor her younger brothers – is a match. She needs blood transfusions every two weeks to stay alive. Jayden’s family started a Facebook page and was contacted by a Concordia student looking to help and, while they have held a bone marrow drive in Montreal, the family has organized the same in Toronto for Sunday, April 21st at two locations: Bialik Hebrew Day School (2760 Bathurst Street) and Aish Thornhill Community Shul (949 Clark Avenue West, Thornhill) from 10am to 5pm. If you are aged 17 to 50, you can help save Jayden or patients like her worldwide by simply having your cheek swabbed. It’s incredibly fast and easy, and for those faint-at-heart, don’t worry, no blood needs to be drawn. There is a special need for males aged 17 to 35. What better way to celebrate spring, when life is renewed, than by helping save the life of a beautiful little girl who should be playing outdoors with her friends instead of merely trying to live. 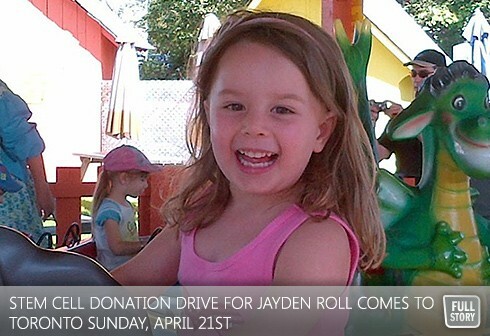 Please come out to the Stem Cell Donation Drive on Sunday, April 21st, and help save Jayden.